If you eat fried chicken primarily for the batter, you'll like the Starline's version. Hours: Wed.–Sun. 6 p.m.–2 a.m. The two-story building at the corner of West Grand Avenue and Martin Luther King Jr. Boulevard that houses the Starline Social Club is on its fifth or sixth lifetime, at least. The place was built as an Odd Fellows Hall in the 1890s and has subsequently been home, variously, to a saloon, a janitorial supply store, a dance club, and a union hall for the deaf. For a big chunk of the past two decades, though, the building sat abandoned, until local artist Adam Hatch acquired the space in 2011 and decided to turn it into a kind of popup event venue, and, now, a full five years later, a bonafide bar and restaurant, with an upstairs ballroom that's been used to host everything from hip-hop shows to weddings to a rollerskating disco night. Hatch has cobbled together a handful of partners, the most prominent of which, on the food side, are Ramen Shop co-owner Sam White and chef Austin Holey, a Berkeley native who worked at Pizzaiolo and at Bones (in Paris), and who said he remembers friends throwing parties in the building when he was in high school, when the space was more or less derelict. With its high ceilings, plaster walls, and winding, asymmetrical bar, the downstairs bar and restaurant section has a kind of old-fashioned grandeur that speaks to all those years of Oakland history — and, of course, also to the contradictions that shape today's rapidly changing Uptown district. On this particular street corner, a few steps away from a highway overpass, the Starline stands out as by far the fanciest place within a span of several blocks. The menu is tiny (maybe ten dishes total on any given night), changes all the time, and seems random if you're expecting the standard elevated-comfort-food playbook you'll find at most upscale bars. Instead, Holey's food is straight-up California cuisine, not all that different from what you might find a pedigreed establishment like, say, Camino — with comparably high prices to boot. 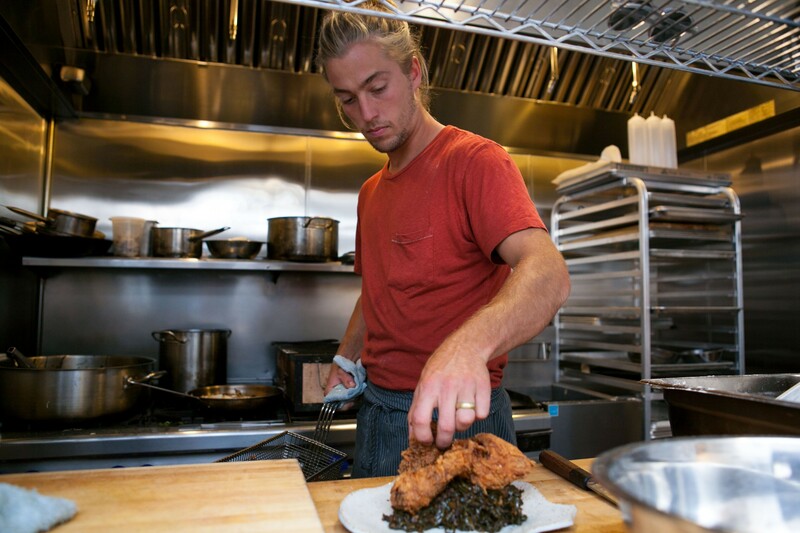 Chef Austin Holey is a Berkeley native. What I can say is that much of the food is very good — like what I imagine a fine-dining chef might serve you if he or she invited you over for a backyard cookout. A rustic late-summer sauté of grilled Monterey squid, sweet corn, bacon lardons, and cilantro was a flavor-packed reimagining of a traditional succotash. Sweet, salty, and smoky elements mixed harmoniously, and a splash of lime juice made all the flavors really sing. The rack of lamb, meanwhile, brought our table to contemplative silence: four thick rib chops fanned out elegantly on the plate, with the long ends of the bones and the blood-rare flesh exposed. The outer edge of each chop had a gorgeous, well-seasoned crust, and the meat was tender enough to render steak knives totally unnecessary. Better to put politeness aside and pick the damn thing up by the bone. A bed of toothsome spaetzle soaked up the meaty juices, and a scattering of adorable baby turnips with their leaves attached added crunch and raw vegetal heat. I gave the side-eye to the $28 price tag for Holey's contribution to Oakland's growing fried chicken pantheon, but my outrage was tempered when I saw how huge the portion was — an entire half-chicken, served mostly in one piece over a mound of deliciously tangy slow-cooked collard greens. If you eat fried chicken primarily for the batter, this is the style of chicken for you — the buttermilk crust is the thick kind that breaks off in big shards that never lose their crunch. Holey drizzles the chicken with caramelized honey at the very end, so you end up with a sticky, savory-sweet effect, somewhat akin to Korean fried chicken. The only dish that fell flat was a watermelon salad that featured, on the one hand, the sweetest and most chin-dribbling-ly juicy melon I had the pleasure of eating this summer. On the other hand, the non-watermelon ingredients never cohered in a way that made sense — not the sliced figs, or the peppery cress, or the few smears of "spicy crème fraîche" (which wasn't spicy at all), to say nothing of the pickled watermelon rind, which was listed in the menu description but never made it onto the plate. It was like eating a bowl of watermelon with an entirely unrelated salad on the side. If none of this sounds much like food you'd expect to find at a bar, that's more or less the point. Hatch and Holey spoke of a desire to straddle the line between highbrow and lowbrow — between a customer's expectation of what bar food ought to be and, well, something a little more ambitious. 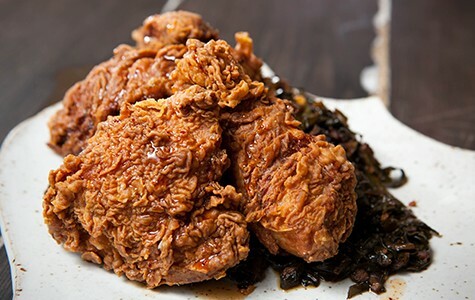 It's by design that the Starline is a place where you can linger over a craft cocktail, but also where you can drop $28 on fried chicken and wash it down with a $3 beer. As Hatch put it, "I like the idea of punks coming in and ordering a High Life and a steak tartare." And the beer-battered onion rings, the one stereotypically bar-snack-y item on the menu, were delicious — thick-cut and juicy, dusted with seaweed salt that evoked, for me, the innumerable nori-wrapped snacks of my Asian-American youth. Frugal bar patrons will want to note, however, that this was the least expensive item on the menu — but the $8 price, for maybe half an onion's worth of rings, is the most I can recall ever paying for onion rings. Ultimately, it was the service — which was idiosyncratic, despite everyone being friendly enough — that reminded me that I was eating at a bar. During one meal, our server was attentive to the point of being hovering. She came over to our table every five minutes, smiling amiably until we wound down our conversation, and then asking, simply, "Is everything alright?" I couldn't tell if she was hoping we'd run up a bigger drinks tab, or if someone on staff had spotted me for a critic, though my next visit seemed to dispel the latter possibility. Seated at the bar, I was mostly ignored for the 45 minutes it took before the aforementioned fried chicken — the only food item I ordered — finally came out. From the very beginning, though, Hatch and his compatriots intended the venue to be many different things beyond just a restaurant. Only a few months since it officially opened, the Starline — both bar and ballroom — already seems to be filling several niches: as a place to go dancing, or to do yoga while accompanied by live music, or to eat rack of lamb at 11 p.m. on a Thursday night. If you strip away all the extras and just treat the Starline as a restaurant, it's kind of a weird place, but not a wholly unlovable one — not when the food is as good, and feels as personal and unique, as it is.